So here by Huawei also enters the Indian market when talking about big tablets. The tablet is none other than Mediapad 10 Link which is good but little expensive when comparing it with other tablets available in the Indian market because you can see that most of the tablets launched by Asus, Samsung and Micromax has always been under the price of 18,000 INR and few days back Sony released a very high-end tablet and then now we have Mediapad 10 Link by Huawei which falls in between the 2 ends. The size of the display has been mentioned above and its resolution is 1280 x 800 pixels which is adequate for the clarity when watching HD videos. The processor used in this case is something different (as it is not Mediatek) and based on the architecture of Cortex A-9, it is also Quad Core and has been named as Hi-Silicon K3V2 which has been clocked at the frequency of 1.2 GHz. As usual, this also does not focus much on the quality of the camera and so you will have 3MP camera at the back panel and then the VGA (0.3 MP) secondary camera in the front, mainly for the video calling purpose. The Operating System used on this device is Jelly Bean Android 4.1. 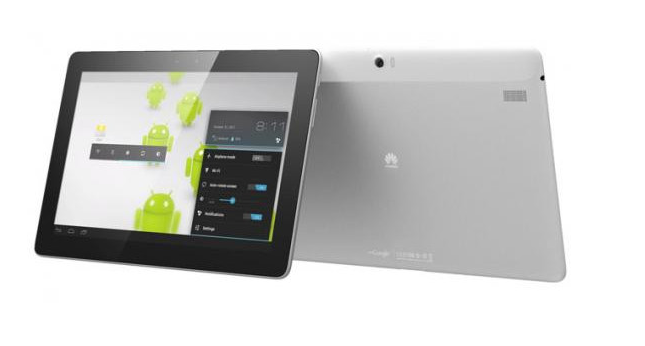 Memory allocation in this tablet is also decent because usually tablets ask for more internal storage when compared with other phones due to obvious reasons and so this tablet has 16GB internal storage capacity which can be further extended to 32GB with the help of external memory microSD card. This tablet also boasts about its sound quality as it has got Dual Speakers on its panel. As of now this tablet is available at the price of 24,990 INR for pre-order on Flipkart and once it gets official launched in India they are good chances that it may hike further. Stay Tuned to know more about its availability from the other resources.